Boil the potato wedges in salted water for about 5 minutes, until just beginning to soften. Drain well. Place in a roasting tin, drizzle with a little olive oil and sprinkle with sea salt. Roast in the oven for about 15 minutes, until crisp and golden. 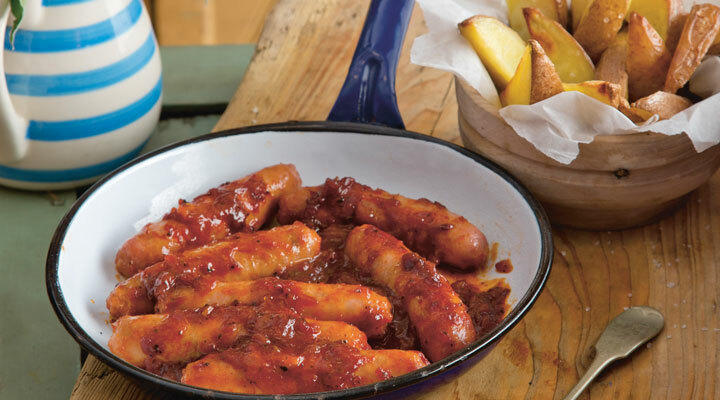 Put the sausages in an ovenproof dish and spread lightly with the Elbow Lane Smokehouse Sauce. Cook in the oven for 15 minutes, until sizzling and cooked through. Meanwhile, put the red onions on a baking tray and toss with 1 tablespoon of olive oil and the balsamic vinegar. Season with salt and pepper and cook in the oven for about 10 minutes, until just tender. Serve on heated plates with salad leaves and any extra Elbow Lane Smokehouse Sauce on the side.